Our beautiful boy Jack is 13 years old and has severe Quadriplegic cerebral palsy due to medical negligence at birth. Jacks under gone lots of surgery throughout his life but he’s a strong boy with lots of potential. 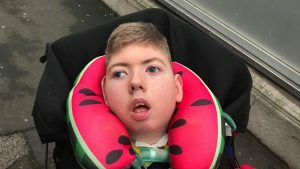 We are asking for your help and support to get Jack stem cell treatment that’s not available in the UK. This type of treatment has no known side effects and has the possibility to help Jack increase his abilities. We want to help Jack and realise this is not a cure but feel after years of research this could be amazing for him. This cellular stemcell treatment is not available in th UK yet so we would need to travel to Panama South America for the treatment. After giving birth to our baby daughter in February 2016 we had planned to bank her umbilical cord blood with a private company called cells for life at our own cost to hopefully use as part of siblings cord blood treatment for cerebral palsy at dukes university in America which has been known to give children with cerebral palsy amazing treatments with either there own cord blood or a siblings ord blood but the hospital took to long to give the phlebotomist our baby’s umbilical cord and she only managed to get 2mls of blood plus tissue so this wasn’t enough blood for treatment to go ahead. Stemcell treatment requires private funding at a cost of around £18,000 for the treatment with flights, accommodation to Panama City. We have managed to raise money ourselves but we can’t afford to get it all and if this is a success we plan to take Jack as an ongoing treatment so would need to keep his fundraising journey going and will need all the help and support as possible. We love our boy and won’t give up on him. All cash donations are held by BLF in restricted funds for Jack’s campaign. BLF will hold funds on behalf of Jack and pay invoices directly.